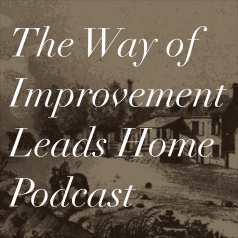 Historiann on The Way of Improvement Leads Home podcast! Writing about an individual who left so little of her own writing behind–and none of it autobiographical (just a few business letters from her term as mother superior)–makes it pretty easy to avoid sympathetic identification with a subject. I think it’s when you have a diary, or a stack of letters that let you into their heads a little bit that you risk becoming an advocate or a partisan instead of a historical biographer. It’s not difficult to empathize with Esther Wheelwright’s experiences and challenges, considering that she endured so much trauma and disruption in childhood. Perhaps in some respects, NOT having a stack of personal papers to use in writing my biography was a gift: I had to struggle to get inside her head, instead of worrying about getting sufficient critical distance, as John’s comments imply. If I’m remembering anything from early childhood, a nun with a ruler in her hand can let her biographer roam at will, free to avoid becoming a hovering defender. Anything that I’ve ever done, am doing, or contemplate doing that revolves substantially around reconstructing a specific life course I still don’t think of as doing “a biography,” because I always drift into deep context, or at least context, and I don’t tend to have issues of identification. Even when making a case, I think I can at least affect objective detachment. One does have, of course, to identify with the facts and the record as uncovered, and a couple of things that I have on the bench now involve treating figures who have been reduced to caricatures of one sort or another, often across a whole range of previous biographical treatments. In that case, you *do* have to advert to the facts and the record, perhaps even tendentiously in some degree, which may come across as a form of defending the subject. In one other thing that I have in process, I’m seeing the original “subject” of the study slowly all-but-dissolve into the context, like a “tiny time pill,” or an antacid tablet in a bubbling glass of water. Maybe it would be better to say a bankroll-able film star becoming more and more of an ensemble player in his own script, or even a wizened character actor, or a candidate for a “best supporting” trophy. As Clio once said, what happens, happens. Heard the podcast and highly recommend it. As also with the Boston radio interview.